On this Christmas Eve, the big man is here. Not Santa, but Aaron Sandilands. He is the biggest man in the AFL and should easily account for the most amount of Dream Team points of any ruckman in 2011. Lock and load this man as your number one ruck? Or are you going something different? Why should I pick him? The big 211 unit is a must have if you’re thinking about locking and leaving your number one ruck spot. Mark my words, he will be the highest scoring/averaging ruckman in the competition (touch wood there aren’t any serious injuries). He knocked out a career best average of almost 98 last year, following on from his DT breakout 95 in ’09. Just to put his DT Rucking dominance, he averaged 12 points more than any other ruckman in DT last year. Sandi has just turned 28, which is a well documented ‘perfect age’ for ruckmen. He won’t let you down with hitouts, as he is rarely beaten… and this keeps his score ticking over. He is spending time up forward and is kicking goals to keep bolstering his score. While he may not improve his average this year, his consistency is outstanding… with potential to smash some decent scores (last year he had a 123, 128 and 130). Why shouldn’t I pick him? With a massive body, injuries have to take their toll. He hasn’t played 22 games yet in his career… and some might be filthy with the big man last year by missing the first 3 weeks of the Dream Team finals series. With their well spread byes, he will be managed a little better? The Dockers recruited Jonathon Griffin for 2011… so his TOG may decrease slightly. Something that we don’t really know at this stage. Deck of DT Rating. 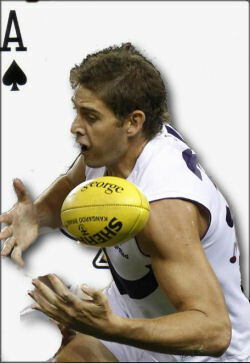 ACE – Aaron Sandilands is the out and out best DT ruckman in the league. Even if his scoring output drops slightly, he will most likely still be on top of the table by a few points. He shouldn’t let you down, however there is some uncertainty and some might look for other under priced options in the rucks. A positive for him is if you’re playing for a league win, is that both of Freo’s byes fall in the multi-bye rounds. This will take some stress out of covering your rucks, especially as they’re often the hardest to keep some life on the bench with. On the flipside, it is a big turnoff having Sandi as your ruckman if you are aiming to take home the car.